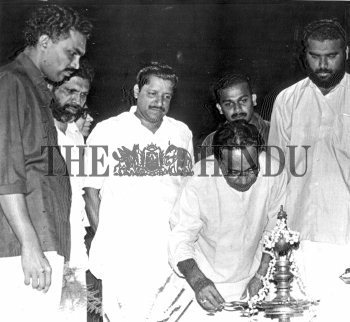 Caption : Mr. Basu Bhattacharya, inaugurating the Kerala University Youth Festival in Thiruvananthapuram. Cultural Affairs Minister, T.M.Jacob, Kerala University Union Chairman, Sunil C.Kurien, G.Karthikeyan, MLA are also seen. 1992-02-20.